A child model, she made her show business debut at the age of thirteen in the Ziegfeld Follies. She quickly became very famous for her work in the show, and by the age of fifteen had already gotten married for the first time. However, the marriage didn't last long, and in 1931 she headed for Hollywood. At first she appeared only in minor roles, but found herself getting noticed nevertheless because of her good looks. One of her most important minor roles from this period of her career came in the 1932 Eddie Cantor film 'The Kid from Spain.' In that same year of 1932, she met Charlie Chaplin, who was twenty-one years her senior. She appeared in his 1936 classic 'Modern Times' as the Gamine, which proved to be her breakthrough role. She also appeared as his leading lady in his 1940 film 'The Great Dictator.' The two were said to have gotten married in 1936, and were known around Hollywood as Mr. and Mrs. Chaplin, but were never able to produce a marriage certificate. This cost Paulette the role of Scarlett O'Hara in 'Gone with the Wind,' a role which she had been the leading contender for. They ended up separating in 1942. She was signed to a contract with Paramount on the basis of her role as Miriam Aarons in the 1939 film 'The Women.' Throughout most of the Forties she was at her peak of fame, appearing in such films as 'Reap the Wild Wind' (1942), 'The Lady Has Plans' (1942), 'Kitty' (1945), 'Second Chorus' (1940), 'Pot o' Gold' (1941), and 'Unconquered' (1947). Her work in the 1943 film 'So Proudly We Hail!' got her nominated for the Academy Award for Best Supporting Actress, though she didn't win. In 1944 she got married again, to Burgess Meredith. This marriage lasted until 1950. 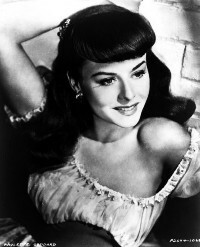 During the Fifties she was in only six films, the last of which came in 1954. For the remainder of the Fifties and the early Sixties she found sporadic acting work on television. In the late Fifties she moved to Europe and married Erich Maria Remarque. http://www.viximus.com/_Viximus/Photos/Raw/6498392A-A496-4E88-8588-912F51B830A8.jpg Goddard, who in her youth, missed out on an education because she had to support herself and her mother, bequeathed US$ 20 million to New York University (NYU). This was also in recognition of her friendship with the Indiana-born politician and former NYU President John Brademas. Goddard Hall, an NYU freshman residence hall on Washington Square, is named in her honor.